HoloTrack Frame gives you complete mouse replacement control that works seamlessly with any program. Users simply point inside a control frame to control interactive content on any size screen. Without having to wear, hold, or touch anything, the user is able to control all aspects of dynamic onscreen content with simple hand gestures. 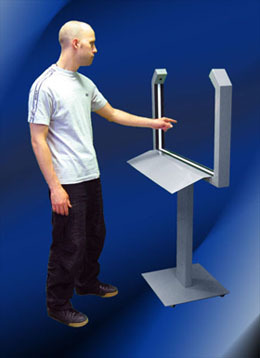 With HoloTrack Frame, any screen of any size can be controlled from any distance. Just add HoloTrack Frame to your display and give futuristic access to any content. HoloTrack Frame can be used in conference rooms, museums, malls, lobbies, and exhibits bringing an immediate impact in consumer interest and interaction. No user contact results in no component breakdowns. The system runs 24/7. High impact: People enjoy using it. Unique and Cool: HoloTrack Frame has often been compared to the futuristic scenes in the movie "Minority Report". No need for repeated cleaning of screens to remove fingerprints. Eliminates phobia regarding non-sanitary touchscreen surfaces. No limit on display sizes.